Globally, more than $3 trillion in mergers and acquisitions are happening this year. And the outlook for all business transformations, including divestitures and carve-outs, is rising. SNP software and services put you in command of the most complex transformations. They enable organizations preparing to merge or to integrate newly acquired companies to visualize their existing SAP landscapes, blueprint the merging of SAP systems, and simulate the impact after harmonization. Execute transformations with confidence at unparalleled speed using SNP software & services. 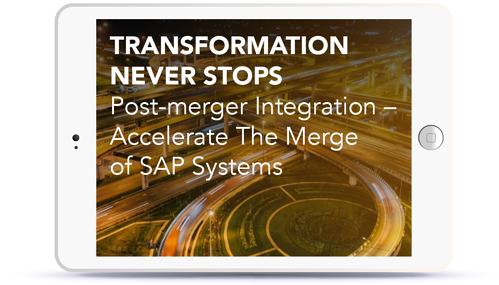 With SNP, traditional post-merger-integration project timelines are reduced up to 75%, delivering the value of newly consolidated entities to the business much faster. No mission is too difficult. Merge the most uniquely customized SAP systems into one with the SNP transformation platform. Our software replaces labor-intensive, repetitive tasks in your SAP post-merger integration project with automated processes. Visually plan your transformation based on existing landscape data to easily spot SAP customizations that can be standardized across the consolidated SAP landscape. Companies that align business and IT processes see better success from carve-out and M&A transformations. The key is a clear line of sight into the existing SAP landscape and how it impacts business processes — a view only CrystalBridge, your transformation command center, can provide. SNP goes a step beyond simply merging your systems into one working consolidated environment. Informed by over 7,000 transformation projects, SNP automation offerings are built to help you assess and select the most efficient processes across systems by collecting key business indicators associated with each one. The best processes can then be incorporated into the final processes that are rolled out in the harmonized environment. The result is process simplification and optimization within the SAP systems. Once the harmonization is complete, your organization will benefit from a streamlined, optimized IT landscape to support future growth initiatives. 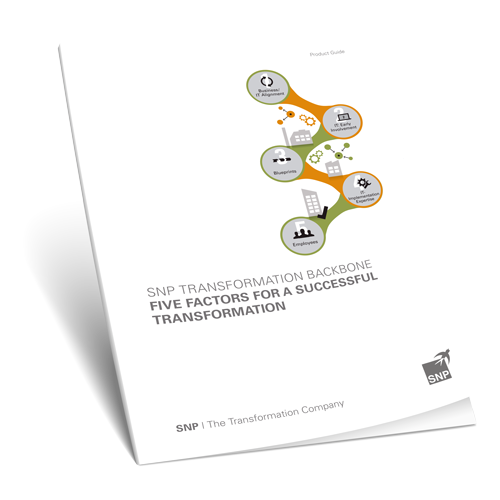 Download this white paper to discover the other key factors for a successful transformation. 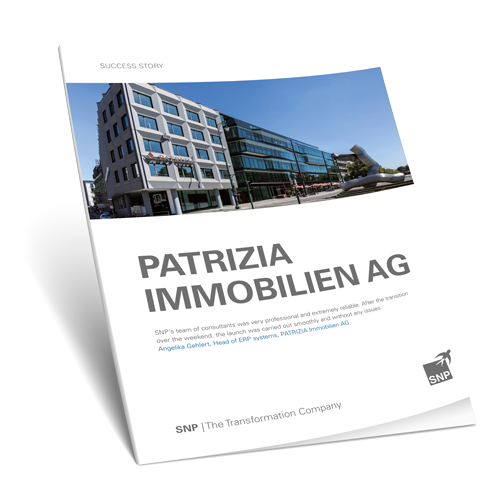 As a result of internal restructuring, real estate provider PATRIZIA Immobilien AG needed to merge seven company codes into one. All transactions had to be reassigned retroactively to the beginning of the year, and existing inter-company relationships needed to be dissolved. In just twelve weeks, the SNP transformation platform completed the planning and testing process successfully. The error-free merge itself was carried out over the weekend, so that on Monday morning, the company was able to begin working with their new company code. Download now to read the full story. Mergers and acquisitions necessitate very complex system integrations and data migrations, especially in the ERP landscape. In addition to the IT infrastructure, of course, business applications and business data must be brought together.